It’s time to bring your vegetables into grilling season! Nothing beats the smell of a fresh garden vegetable roasting over wood even on an LP/gas grill. Make this the time of the year you’ll get great char wood flavour in your seasonal vegetables. An LP or gas grill – any brand or size will do. 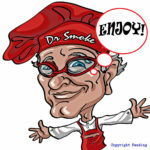 “Double” Filet wood chunks from SmokinLicious® Gourmet Wood Products. a couple of heads of cauliflower. Pick the color you like the best – white, yellow or even purple! Make sure your grill is clean from any significant grease build up. Remove the grilling grates and determine how much space is between the diffuser and the grilling grate. The diffuser is the plate covering the unit’s gas burner(s). Once you have the sizing computed, then select the SmokinLicious® wood chunk size that will fit – Single Filet which is ~4 inches or the Double Filet which is ~2 inches. Now, let’s set up the wood on the grill. Remove the cooking grates from the grill then strategically place the wood chunks over the heat diffuser. This is the metal piece covering the actually gas burners. If the SmokinLicious® wood chunks are fresh, then you can add them directly to the unit without pre-soaking them. If not, you may want to consider a lite soaking of about 15 minutes. Because I’m cooking cauliflower, I am using the chunks in their natural state. However, feel free to consider a pre-soak in liquid with flavouring such as beer, wine or juice. Now replace the grill grates back on the unit, over the SmokinLicious® wood chunks! Make sure the grates are securely seated back on the unit. If there is a lot of space on your unit between the diffuser and the grate you may want to consider a SmokinLicious® single filet or block item. Now light the unit, set the dials to a low heat setting and bring the unit up to temperature. Say around 180 degrees. Do not overheat the unit. In preparing my cauliflower for this cook, I’ve elected not to reduce the cauliflower heads into pieces. I prefer to do the cutting towards the end of my grilling presentation. 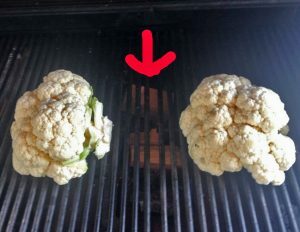 After pre-heating the grill to around 180 degrees, I add the cauliflower heads to the grill grates. Let the wood infusion flavour begin! 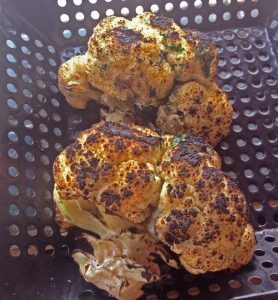 I position the cauliflower head over the hot spots created by the SmokinLicious® “Double” filet wood pieces which are under the grilling grates. 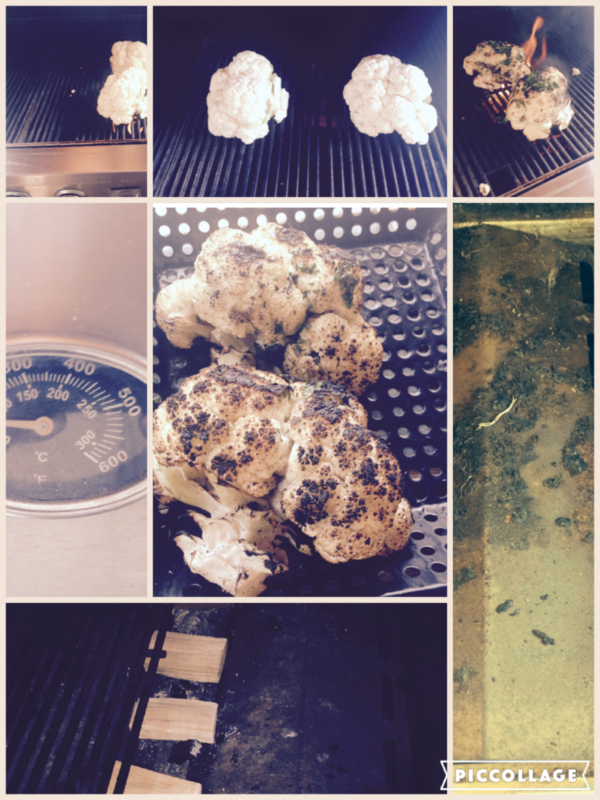 The wood will ignite and begin the charring stage of the heads of cauliflower. 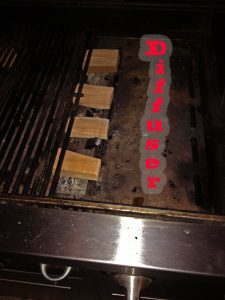 I recommend bunching the wood pieces together to produce a hot spot on the LP/gas grill to allow for a direct char technique. While I am not using the smoke from the wood, I am still infusing great natural grilling flavour with the wood. My cooking is taking place with an open lid because I want to char not smoke! It’s important to keep turning the heads so the flavour will be even. 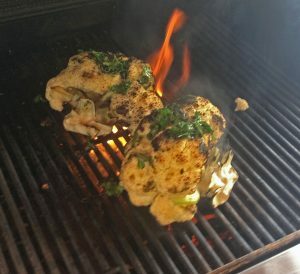 In the final stage of charring, I add some fresh parsley to the cauliflower heads for final flavour and presentation. And, of course, I love to drizzle melted butter sometimes infused with paprika, to the finished product. Remember this is a vegetable, not meat so there is no grease to flare up the LP/gas grill. This is another example of why using SmokinLicious® Wood Chunks on the diffuser and under the grill grates of your LP/gas unit can generate such exceptional wood-fired flavour. Now, get those head of cauliflower and ENJOY! Note to visit our @smokinlicious and #smokinliciousmenu on Instagram for audio instructions and other cooking techniques.